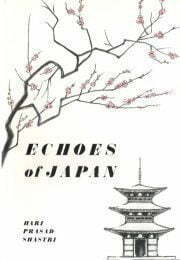 Echoes of Japan contains twenty short pieces of anecdotes and reflections by Hari Prasad Shastri from the two years he spend in Japan 1916-18. They are records of qualities that he most valued in his experiences there. Matsuko San was young and good-looking and well-educated. She loved her parents and was at peace with all her neighbours. Her sweet disposition, tender way of conversation and love of peace made her popular with all those with knew her. As she walked to her school of painting in Hongo, Tokyo, in her brilliant kimono, her serious countenance attracted the notice of the people and exhalted their minds to the region of beauty and truth. She met a young student of the Imperial University, named Nagama, who was very handsome, the son and heir of a rich father. After a few unguarded interviews Matsuko loved the young man. They often went together to the local story-teller and the poetry-reading meetings. In the receding dusk in the autumn, when peace spreads over Tokyo like a golden cloud at dawn and the maple leaves turn crimson, the two walked together in the Ueno Park by the side of the tomb of Benten Sama, Goddess of Learning. They did not touch each other nor laugh immoderately. With the autumnal moon reflected in the tranquil water, they stood under a tree and watched nature in complete silence. Nagamachi’s wealthy father did not agree to the proposed marriage of his son with Matsuko. The lovers ended their companionship like lotuses which close their petals when the sun is set. Matsuko passed her art examination. I was present at the ceremony of distribution of the diplomas. Matsuko was prominent as a painter. She had lost all interest in the world after the dissolution of her friendship with Nagamachi. She studied the Buddhist classics and painted Buddhas and Kwannon Sama. She did not pay much attention to her toilet. She lived a retired life, visiting the Benten temple in the centre of the tranquil lake. I loved the maple groves of the park in autumn. As the leaves fell, I sat contemplating the temporary character of the beautiful, and watched the sunset in silence. One evening, on New Year’s day of the year 1917 I walked in the park. The trees were without leaves but the grass was still green, for the lowly are blessed by nature. I saw a voung nun going to the temple in a serene and dignified manner. Her eyes were fixed on the ground and she walked with tranquil steps, demonstrating that passions had left her and her soul was set on the eternal and the blissful. When she passed close to me I recognised her as Matsuko. I bowed to her and she responded with a slight salutation. I saw the rosary in her hand. She was peace personified. The Buddhist magazine of Hongo published some poems by the nun Matsuko who was admired for her artistic talents and her purity of life. She was asked to light the lamp of the temple of Buddha, situated on a high hill. In rain and by starlight she carried a lighted candle and lit the temple lamp every evening. It was a hard task but she undertook it with calmness because her Guru had asked hex to do so. The Temple is situated on the high, rugged hill. The way is full of pitfalls and beset with snakes. The wind is bitterly cold, the sky is dark. I struggle on and on to light the lamp in the temple. My own lamp is blown out; I light and re-light it. What a joy to light the temple lamp to guide aged devotees to the shrine! To guide weary steps to the door of Nirvana, truth eternal. Matsuko lived in complete obscurity. She taught painting in a Buddhist school to the children of the poor in a humble quarter of Tokyo. Nagamachi, a graduate of the Imperial University, now studied Buddhism and lived a life of benevolence, contemplation and retirement. He devoted his wealth to charity, founded schools for the poor and sanctuaries for the birds. I heard in 1925 that Nagamachi became a monk. He came to China to attend a Buddhist conference. I met him and congratulated him on his real love which led his soul from the finite to the Infinite.